Home Mental Health First Aid Blog How Much is Too Much? A lot of people drink alcohol to help take the edge off after a long day. In fact, roughly 86.4 percent of people 18 years or older have drunk alcohol at some point in their lives, and 70.1 percent have drunk alcohol in the past year. But what happens when one glass of wine after work turns into two, three, or four on a regular basis? 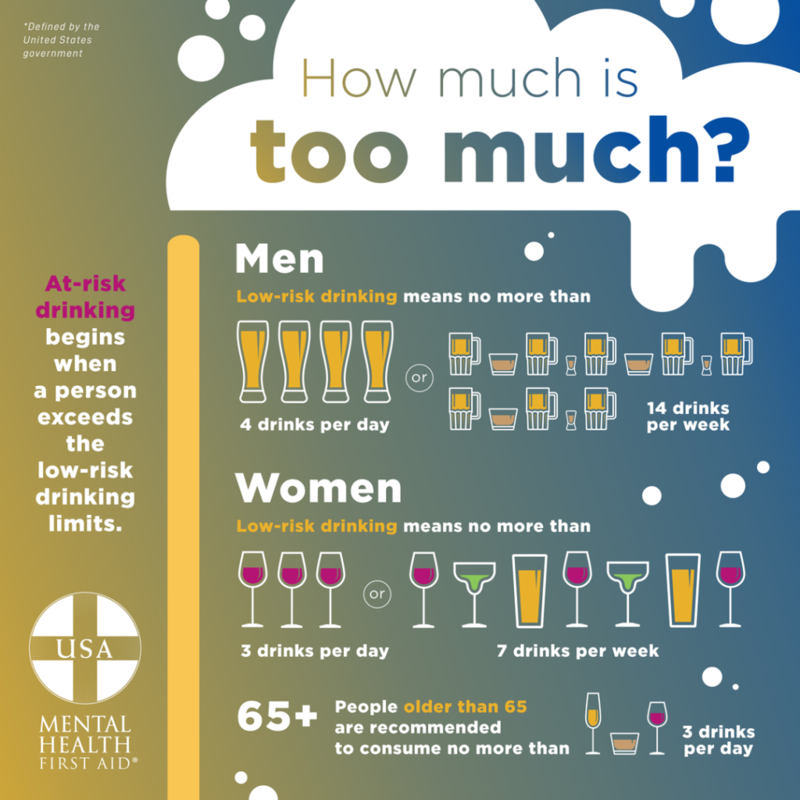 Low-risk drinking for men: no more than four drinks per day and no more than 14 drinks per week. Low-risk drinking for women: no more than three drinks per day and no more than 7 drinks per week. Low-risk drinking for individuals older than 65: no more than three drinks per day. At-risk or problem drinking begins when these limits are passed. And with heavy and continued use, alcohol can cause potentially serious physical, psychological and social problems, and can lead to other substance use disorders, anxiety and even depression. This is why awareness is important. We need to be self-aware of our own drinking habits and keep an eye on the drinking habits of our loved ones to make sure alcohol use does not become an alcohol use disorder. Mental Health First Aid can help. Mental Health First Aid teaches people to recognize the signs and symptoms of alcohol use disorder, short-term and long-term problems associated with alcohol intoxication and how to help those who may already be addicted. Learn more about Mental Health First Aid and get trained today.